I’ve come to realize that many of us have been bequeathed a cherished family recipe—a dish so delicious that we instinctively know it would be universally beloved. It may be elaborate and require the skills of a culinary savant to assemble it, or so simple, so unfussy, that even the most hardened of hacks can prepare it with ease. But when it is served, it is the unmistakable, reliable star of the meal, whether celebrating triumphs, comforting woes, or keeping family memories and traditions alive. It seems almost cruel to withhold such heirloom recipes from the world at large. Hence, I am championing the cause of the family recipe. I will entice the people in my universe to share favourite, nostalgia-infused family recipes, and I will give one of them centre stage in this very space on a monthly basis. In the end, we are all family, and these recipes represent the legacies of our shared passions. First up, the recipe for my mom’s tourtière. Enjoy! 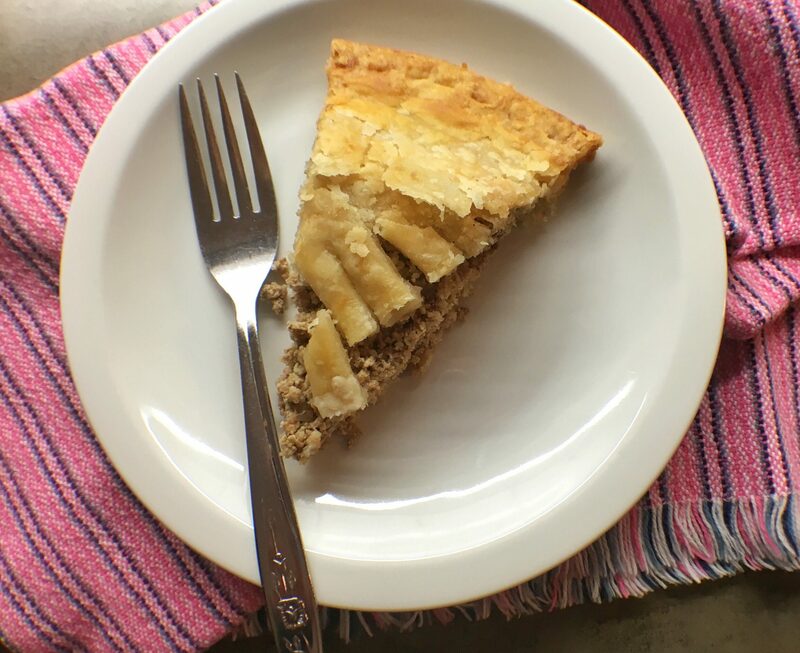 A tourtière is a very traditional French-Canadian dish served by generations of French-Canadian families throughout Canada. As a child, I remember the smell emanating from the kitchen—that smell was a sure sign that the holidays were near. Not near like next week near, but near-ish like next month. Or the month after that. You see, tourtières are generally prepared early, weeks, even months before the holidays. And, then they’re frozen so that they can be enjoyed well into the new year. Also, they’re prepared in bulk. To muddy things further, my mom, the holder of the recipe, is not beholden to an actual written recipe. Thankfully, she has committed one to memory, just like her mother before her. But, that’s where the lineage ends. There is a faint recollection of the recipe belonging to this or that aunt, or perhaps, her great-great-great grandmother. But, since everyone aforementioned has departed this earth, origin cannot be verified. While a small crowd huddles in the portico, some stragglers linger out front. Others, like myself, skedaddle and exploit the “we’ll text you when a table is ready” offer. You see, Wilf & Ada’s doesn’t take reservations. Waiting is the only option and there’s no way around it. Is the food worthy of such effort? Affirmative. This place should be on your “must get-to” list! When you do finally get a table, try the “Eggs in Purgatory.” They will deliver you immediately to heaven. This dish is a carefully conceived idea with delicious results. Picture a small cast-iron skillet containing two eggs poached in a spicy tomato sauce, covered with a light dusting of Grana Padano, and topped with a heaping of arugula. Toast and homies ride shotgun. You could also go for the breakfast hash. This particular one I tasted off the “specials” menu was made-up of a trio of roasted root vegetables—beets, squash and yams—tossed with caramelized onions, some crumbled sausage and Parmesan. The mélange was topped with two eggs and a side of toast. An unfussy breakfast, yet beautifully articulated and belly-filling. What else is worth the wait? The servers. Instantly lovable, gabby and dedicated to ensuring that you have the best experience. The décor has the sparest of adornment yet is fitting for the space. And while the wait is a bit of a bummer, the food at Wilf & Ada’s earns high marks for sticking to the old rule book: make as much of the menu in-house, from scratch and source the best quality ingredients using local suppliers and products whenever possible. And, make it delicious! Wilf & Ada’s is on 310 Bank Street in Ottawa and is opened 7 am-3pm on weekdays and 8 am-3 pm on weekends.